Advanced framing is a term that is being thrown around a lot. What does it really mean, and why should it matter to you? Advanced framing is one of the most cost-effective solutions you can use when building a home. Not only will it be structurally sound, but it will balance the ever-growing energy codes with building code requirements. 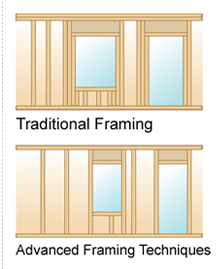 Through advanced framing, you can improve your materials and produce a quality wood-framed building. So what makes a frame advanced? Using this form of framing will reduce material and labor costs. Pair this with fully sheathed OSB panels, and you have a structure that can stand up to nature and the home owners! So if you would like to produce structurally sound and energy efficient homes, while also keeping the costs down, advanced framing is for you. For more information visit: http://www.apawood.org.